Marcello has been teaching and treating in Amsterdam/Netherlands in the past years, has collaborated with the pregnancy centre “Moederakademie” in Amsterdam and has held seminars in Spain, Greece, the Netherlands, Germany and Sweden. Most recently he has been invited as a speaker to the International Spinning Babies Conference in Minnesota/ USA 2016 and 2017, Australia 2018 - and hold courses in Oslo, Norway for Doulas and midwifes. 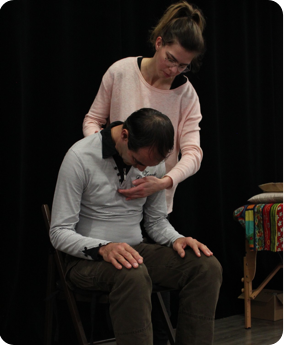 HELENE JANK is a certified Somatic Psychoeducator , MDB instructor and professional theatre maker. In 2017 she has founded the Dutch international school of Somatic Psychoeducation MDB in Amsterdam, Fasciacollege.com. She qualified as Perceptual Educator at TMG Fascia Concept Institute Paris (Therapie Manuelle et Gestuelle) under the guidance of the founder of Fasciatherapy MDB Prof. Dr. Danis Bois and Dr. Hélène Bourhis. Next to applying MDB in private sessions in her office in Haarlem, Helene has been assisting at the Integral Touch of Birth seminars in Minneapolis, USA in 2017 and been frequently teaching MDB classes in the Netherlands. After attending a one year intensive course in Osteopathy in 2017 (Sutherland Institute Amsterdam), Helene is currently in formation for the MDB Fasciatherapy program at TMG Fascia Concepts, Paris.